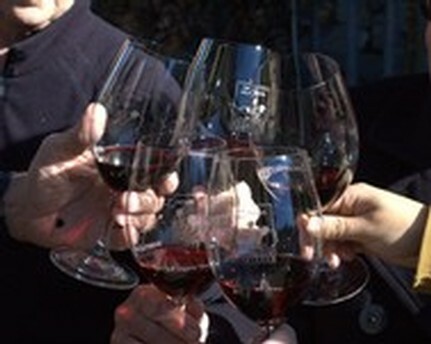 Ever find yourself in the wine section of the grocery store wanting to try a Chianti from Italy or a Rioja from Spain? The international wine selection can be overwhelming. Where do you even start? Join us from 5-8 PM on January 31st at the tasting room for this wine club only event to taste 14 of Gary and Carol's favorites from their recent trip to Spain! Gary and Carol will be there to tell stories and answer questions about their recent trip. Gary and Carol select the wines that they believe you would enjoy the most. Limited space available! 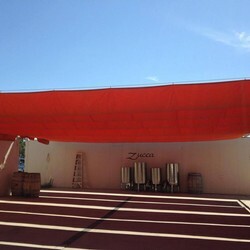 Contact Jody at 209-684-3278 or jody@zuccawines to reserve your spot. Reservations are $25 dollars per person and must be made by January 24. Don't miss out on this rare opportunity! The time has come where Gary and Carol start the process of turning tons of beautiful grapes into the delicious wine you can take home in a couple years. 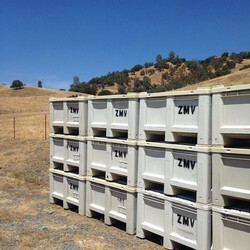 Grapes arrive in the morning from vineyards in Calaveras County and Amador County to find our eager crew at Zucca's crush pad. 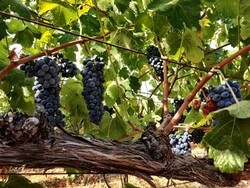 The grapes are dumped on a table (as seen above) to allow us to hand sort and remove any bad bunches of grapes so only the best grapes will be used. From there, the grape must (juice, skins, seeds and some stems) ferment for a week at the winery before it is pressed and the juice is moved to barrels or stainless steel tanks. Okay, it's time to get back to work! 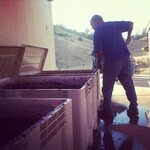 Gary punching down the Syrah must. 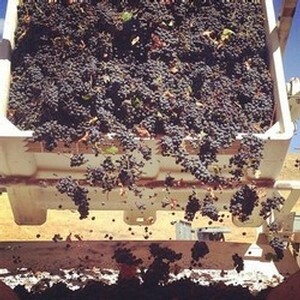 Bins need to be punched down a few times a day for the week to mix the must and juice and spread the yeast. 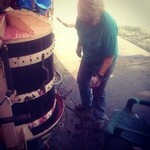 Carol gets a little messy while pressing the Syrah. The bladder press seperates the juice from the skins and seeds. We had a great time at our 2nd annual Railtown Sip and Ride Benefit. It benefits a great organization and we are excited to be able to put on the event every year. We will be holding the event around the same time next year so be on the look out for more information. Getting geared up to bottle! We are getting everything together so we can start bottling in the middle of March. Bottles, labels, corks, and more are making their way to the winery to come together to store some more great varietals! All the hard work of crush and press, fermentation, lab tests, and other winemaking processes will finally wrap up too great a bottle of wine that we get to share with you. We will keep you updated on how it is going!